12/17/2016Share this story on Facebook! 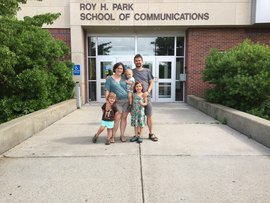 Kinch and her family in front of Roy H. Park School of Communications. Trying to find a job can be difficult for anyone, but trying to find a job in a new country where you don’t know the language can be extremely challenging. Stephanie Kinch ’06 found herself in this situation after she found a job in the field she had always wanted to be in. Kinch was a reporter for Messenger Post Media, a news outlet in the greater Rochester, New York, area. Kinch’s husband, who is a planetary scientist, had finished up his research at Cornell University and had to go back to Denmark because his work visa was soon to expire. Kinch of course went with him, but not knowing how to speak Danish, and knowing that there wasn’t really a big market for non-Danish speaking newspaper reporters in Denmark, she realized that she would have to leave the field she has always wanted to work in. Kinch spent three years earning her master’s degree in media and communications and learned how to speak Danish. In her second year at graduate school, Kinch had her first child. “Luckily, Scandinavia has a very supportive system for new parents. I was able to take a year off of school with no penalty and my husband received six months of paid paternal leave.” Kinch said. Despite receiving her master’s and learning Danish, Kinch still had trouble finding a job. She soon realized that she just didn’t have the right experience for the corporate world. Though she found this to be true, Kinch did have something else that would be an asset to her in the corporate world and that was a writing background and native English proficiency. I stopped looking for jobs and started looking for freelance work. I contacted hundreds of companies, had many meetings, and received many rejections. Eventually I got my foot in the door with a few companies and people began to take me seriously,” Kinch said. Now, Kinch works for herself as an English-language journalist and social media specialist, where she helps Danish companies to communicate in English. Some of those Danish companies include Bang & Olufsen, a Danish consumer electronics company, and Carlsberg, one of the world’s largest brewers. Kinch’s biggest client is Widex, a leading hearing aid manufacturer. Kinch works as the company’s social media content community manager. In this position, she works to define social media strategy, write and plan content, and interact with online community members. Kinch writes almost all of the content for www.widex.com/blog. Kinch received a journalism degree from Ithaca College, but she explained how the Park school prepared her for so much more. Kinch said that the best lessons she learned came from outside of the classroom, and she urges current students to utilize those opportunities. Kinch may not be a journalist in the traditional sense, but she is still able to tell stories. Over time, she realized that there are many different ways to share the experiences of others and she credits Ithaca College for giving her the foundation to do so.